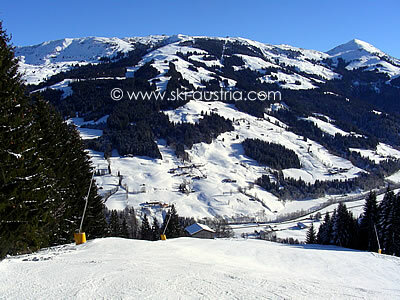 The skiing in Westendorf has undergone a transformation in recent years. Originally thought of as a typically Tyrolean village ski resort, its connections with the massive SkiWelt area led to it being appreciated by generations of keen and younger skiers and boarders looking for a value resort with lots of runs. The new connection to the Kitzbühel area via the KiWest gondola has turned the resort into the hub of a massive connected ski area in the Tyrol. 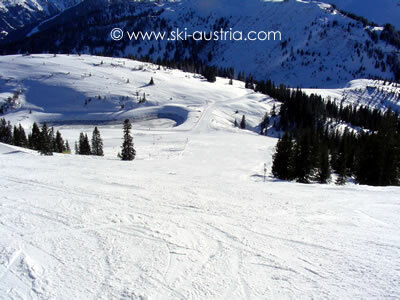 The main access to the upper slopes, however, is by a short skibus trip to the bottom of the Alpenrosenbahn. This gondola rises in two stages to the top of the ridge above the village and it is possible to get off and on at a mid-station. On the journey up, skiers and boarders will get a good view of the interesting intermediate runs heading back down again into the valley. These lengthy pistes run through woods and farmhouses and are especially attractive when fresh snow has fallen overnight. The Choralm gondola crosses the main valley lift and offers an alternative route back to the ridge at a higher point where the single Choralpe chairlift and the SkiWelt gondola from Brixen meet. 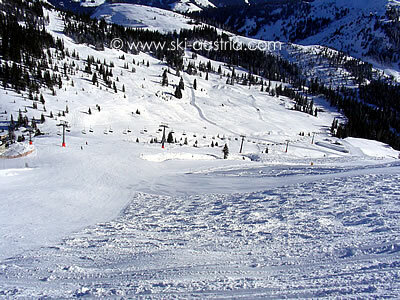 Previously the run from the bottom of the Choralpe chair back to the valley had been an off-piste ski route, but with the building of the new SkiWelt connection, it has been turned into a proper red run and, as well as offering another lengthy option for Westendorf skiers, it is the easiest way to access the main skiing on the other side of the valley in the SkiWelt area. Back on the ridge above Westendorf at the top of the gondola station, the closest other lift is the popular Talkaser four-man chairlift, with its flattering and short intermediate runs often used by ski school groups. Skiers wanting to head further afield will pass the Talkaser restaurant on the ridge and the short drags on the left to take the long traverse onto the access run to the bottom of the Fleiding chairlift. The long red runs off this chair are a perfect example of the typical Westendorf run - groomed intermediate red and blue runs with enough pitch to allow skiers to build up confidence. More advanced skiers will come into their own in fresh snowfalls when the areas between the runs and under the chairs become a paradise for powder skiing. Small bumps runs (although not official runs) are also visible under some of the chairs. Another run for better intermediate skiers is the route down into the Windau valley past the Schrandlhof and Gassnerwirt restaurants. This results in a bus ride back to the base of the Alpenrosenbahn gondola again. 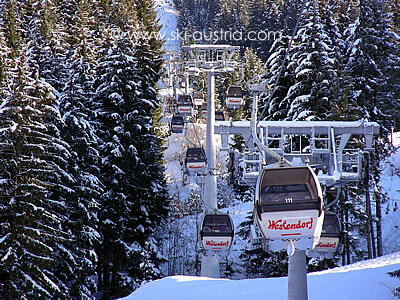 The other alternative from the Fleiding chair are the short up and down chairs over to Westendorf's new pride and joy: the KiWest gondola, which links into the Kitzbühel area. The run down to the base of the gondola is a long and easy intermediate run. It should be noted that this lift and the others on this side close relatively early to force skiers onto the return route to their main resorts so that they are not caught miles from home at the end of the day. The link to the Kitzbühel area (by way of Aschau up the valley from Kirchberg) is not covered on the SkiWelt liftpass (the main one sold for the Westendorf area). 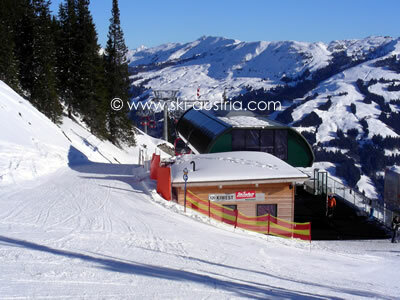 Skiers wanting to utilise both the SkiWelt and the runs in the Kitzbühel area need to buy the Kitzbüheler Alpen ski pass which is around 20 Euros more expensive for six days. 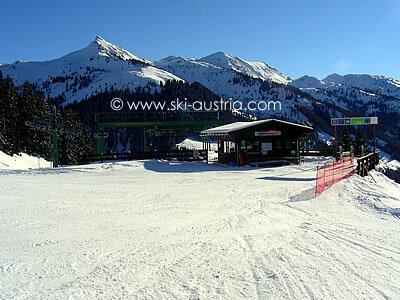 Skiers wanting to use the rest of the SkiWelt area will find the best connections at Brixen, for the connections over the Scheffau and Ellmau, or at Hopfgarten, for the connections to the Hohe Salve, Hochsöll, Söll and Itter. 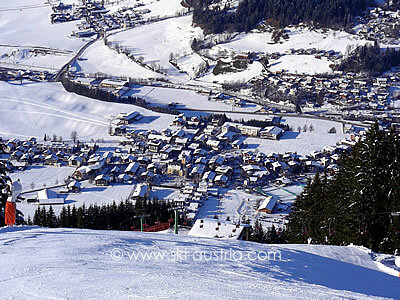 Looking for the best ski accommodation in Westendorf? The live webcam stream below is taken from the Talkaser lift.